Royal Memories: Prince Charles' Tribute to The Queen re-aired May 26, 2016. Watch Prince Charles’ tribute to Queen Elizabeth — as the nation’s monarch and as his mom. In Royal Memories: Prince Charles' Tribute to The Queen, HRH The Prince of Wales shares memories and recalls events from Queen Elizabeth II's public and private life. Drawing on archive news reels and never-before-seen home movies and photographs, The Prince reflects back on Her Majesty’s 60 year reign – both as the Great Britain's Queen and as his own mother. Previously-unseen photographs and cine films from Her Majesty’s private collection – many of them shot by the Queen herself – capture family life. 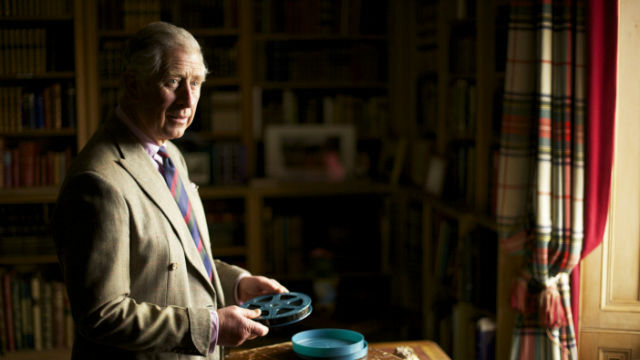 The Prince of Wales with a box of Queen Elizabeth II's cine films. The Prince also shares footage from various family holidays, including one sequence, filmed by The Queen, in which we see a young Prince Charles and Princess Anne playing in the sand at Holkham beach in Norfolk. Highlights include private cine camera footage, taken on Coronation day behind the scenes at Buckingham Palace, which shows Her Majesty juggling the dual role of mother and Queen as she walks along the corridor of Buckingham Palace and poses for official photographs. There are also cine film sequences on board Britannia, at Windsor and at Balmoral, all of which give the viewer a fascinating insight into the life of the Royal Family in the 1940s and 1950s. Royal Memories is a Crux Production for the BBC in association with Rare Day. A Crux production for the BBC, in association with Rare Day. Photography © Clarence House, Buckingham Palace, British Pathé.